You probably think of handwriting mechanics as the act of picking up a pencil and writing on paper. And while that is true, there are some important skills that need to be in place for a child to be successful with this. 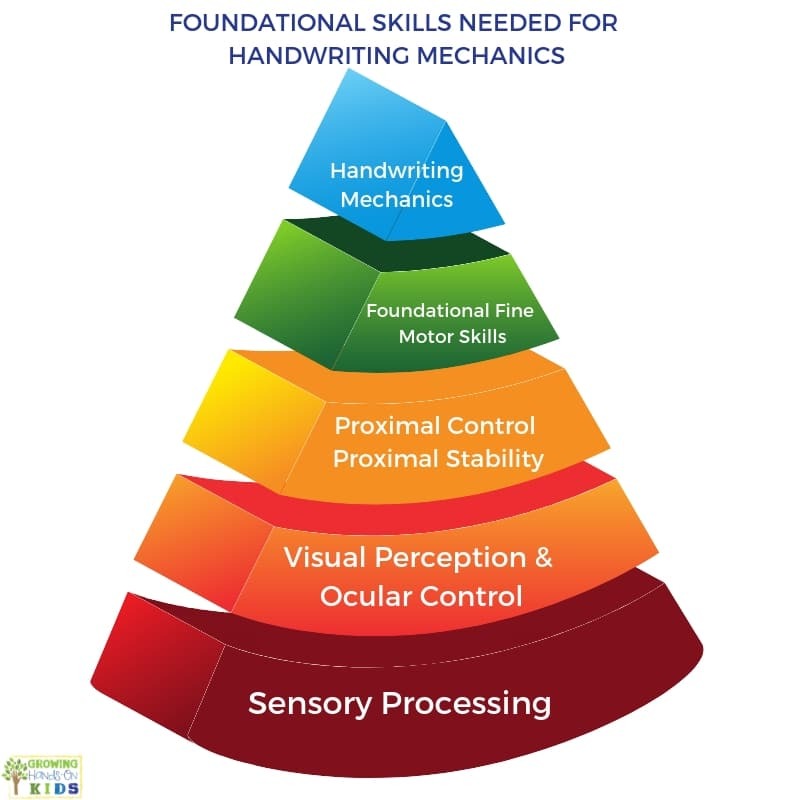 Let's take a look at the foundational skills needed for handwriting mechanics. Does the graph above surprise you at all? If you are familiar with the pyramid of learning and the central nervous system by Taylor & Trott (1991), then this graph seems similar. Before we can expect our children to master handwriting mechanics (or pencil grasp), we need to build these foundational skills to set them up for success. 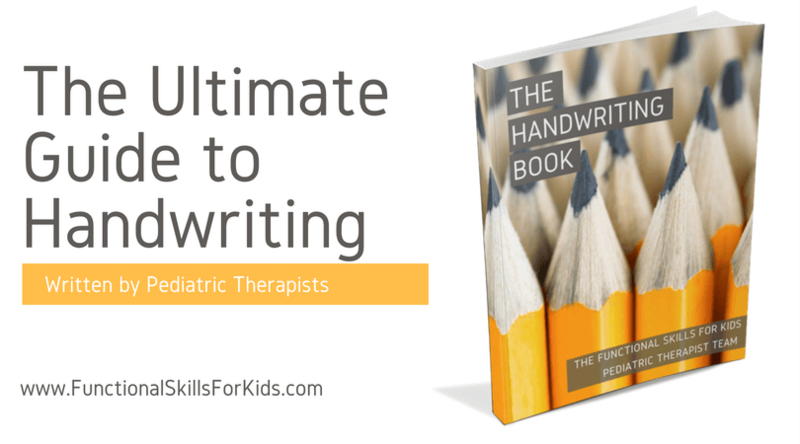 This doesn't mean your child won't have struggles with handwriting mechanics if you address these areas, but it will give them the tools they need to work around these struggles. You can read more about the typical development of pencil grasps here. Sensory processing is the first to develop at birth. As a baby explores its environment, it learns to react to incoming sensory input. Children who struggle with sensory processing will struggle with other areas of development including poor reactions, attention, and poor body awareness. The three sensory systems primarily responsible for these is the vestibular system, proprioceptive system, and the tactile system (or touch). These three systems are responsible for how a child will hold a pencil later on, eye-hand coordination, writing on the lines, coloring between the lines, depth perception, bilateral coordination skills needed for holding the paper and writing with a pencil, using scissors, or using a dominant hand with writing, motor planning for new task, and attention to task. To learn more about sensory processing, you can sign up for my 9-day sensory processing email series here. 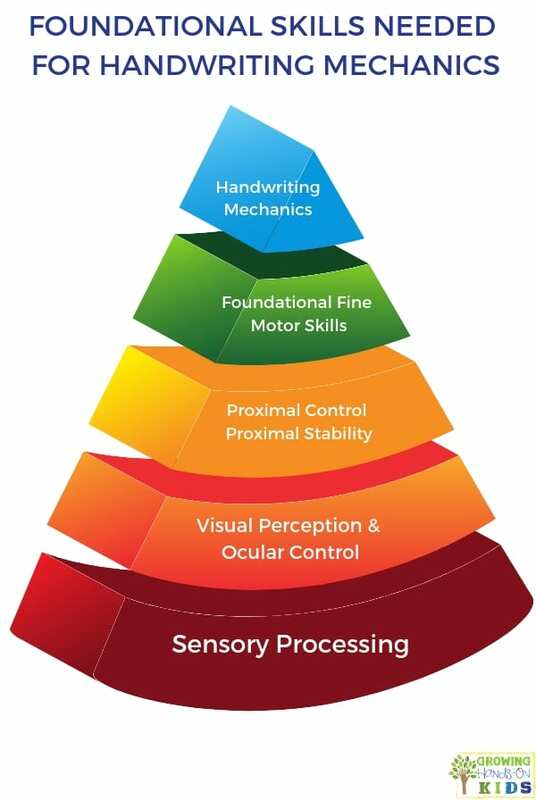 Sensory processing and visual perception are closely related through the three systems I mentioned above. Visual perception is the process of the brain taking in and organizing the information we get through our eyes. When a baby is learning to pull its head up and begins to roll or crawl, it is also developing its visual perception skills. Ocular control refers to the ability to control the position and movement of the eyes in order to focus on an image or object. This is especially important for handwriting so that the student can visually focus on their handwriting and also copy from the board or a book. Before we talk about proximal control and stability, we need to define proximal, a therapy term. Proximal refers to the muscle groups closest to the middle or center of the body. So when we talk about proximal control and proximal stability, we are referring to the core strength (or control and stability) needed for different tasks. 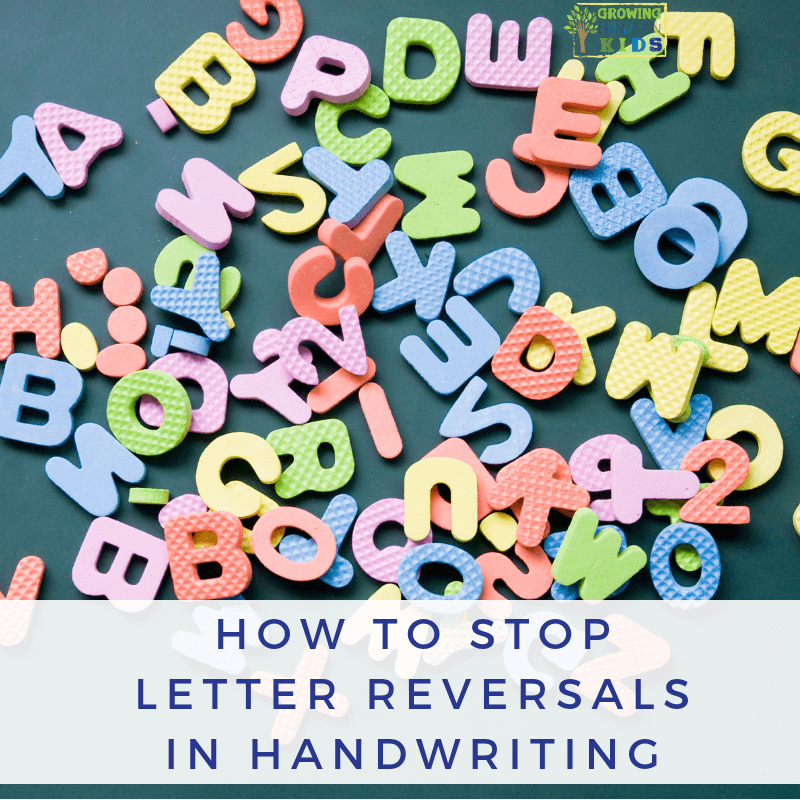 When it comes to handwriting, children need the core control and stability to sit up straight and not slouch, arm and shoulder control as they move the pencil, and neck control to hold their head up straight. If a child struggles with any of these gross motor areas, handwriting may be a struggle because they lack the core control and stability they need to perfect smaller movements such as handwriting. Here is a great post on proximal stability from my friends at The Inspired Treehouse (pediatric Occupational Therapist and Physical Therapist). Proximal control and stability are dependent on visual perception to tell them where their body is in relation to things around them. And it is also depending on the sensory processing system which also supports body awareness. All of these systems need to work together in order for fine motor skills to be perfected for handwriting. Most of us probably think of fine motor skills when we think about the areas of development needed for handwriting. But as we have seen, we need all the systems above to be working properly for fine motor skills to develop functionally for handwriting and other every-day life skills. There are specific fine motor skills that help with handwriting so let's take a look at those briefly. wrist stability and extension (functional positioning during handwriting includes the hand resting on the table with the wrist slightly bent back, or extended, while the fingers move the pencil for writing). You can read more about the fine motor skills needed for handwriting in my blog post here. If you have a student who is struggling with handwriting or you just want to educate yourself more on the skills needed for handwriting, I highly recommend The Handwriting Book. Written by 10 pediatric Occupational and Physical Therapists (include me! ), it will give you the tips, tools, and strategies you need to support handwriting skills and help struggling writers.